As the women’s race for the Vienna Major title dropped from 16 members down to four, all five American pairs were eliminated from the competition. Two of the United States pairs were knocked out by friendly faces in a two All-American Round of 16 matches with No. 17 Kelley Larsen/Emily Stockman besting No. 13 Kelly Claes/Brittany Hochevar and No. 6 Alix Klineman/April Ross sweeping qualifiers Lauren Fendrick/Sarah Sponcil. Klineman piled up 16 kills, two blocks and two aces as she and Ross moved on. Stockman carried the load with 20 kills, and two aces, including the match-winner, for her team. Team USA’s No. 14 Sara Hughes/Summer Ross were among the eight teams to move on to the quarterfinals, rallying past Italy’s Marta Menegatti/Viktoria Orsi Toth (16-21, 27-25, 15-8). All three Brazilian teams won in tiebreak, with Carol/Maria Antonelli rallying past Russians Nadezda Makroguzova/Svetlana Kholomina (14-21, 21-14, 15-13) and Agatha/Duda coming from behind against Germany’s Sandra Ittlinger/Kim Behrens (24-26, 21-14, 19-17). Barbara/Fernanda held on for the 21-15, 16-21, 15-10 win over Poland’s Kinga Kolosinska/Katarzyna Kociolek. In the quarterfinals, two of the four matches went the distance with Barbara/Fernanda rallying past Agatha/Duda (15-21, 21-18, 15-11) and Meppelink/Keizer overcoming an opening set to Klineman/Ross (17-21, 26-23, 15-10). Carol/Maria Antonelli swept Larsen/Stockman (21-14, 21-17) and Hughes/Ross came up short against Hermannova/Slukova (21-12, 21-12). The four quarterfinal losers all still will leave Vienna with a $12,000 paycheck. The semifinal matchups leave the possibility of an all-Brazilian final with Carol/Maria Antonelli and Barbara/Fernanda on opposite sides of the bracket. No. 10 Carol/Maria Antonelli will face No. 7 Hermannova/Slukova, while No. 4 Barbara/Fernanda will try to get past No. 16 Meppelink/Keizer. Carol/Maria Antonelli, who finished fifth in Vienna in 2017, are looking for their third podium finish of 2018, following runnerup efforts at the Espinho and Hague Four Stars. Hermannova/Slukova are looking for their first FIVB gold medal since winning the Ostrava Four Star on June 24 after placing third at the CEV European Championships on July 21. 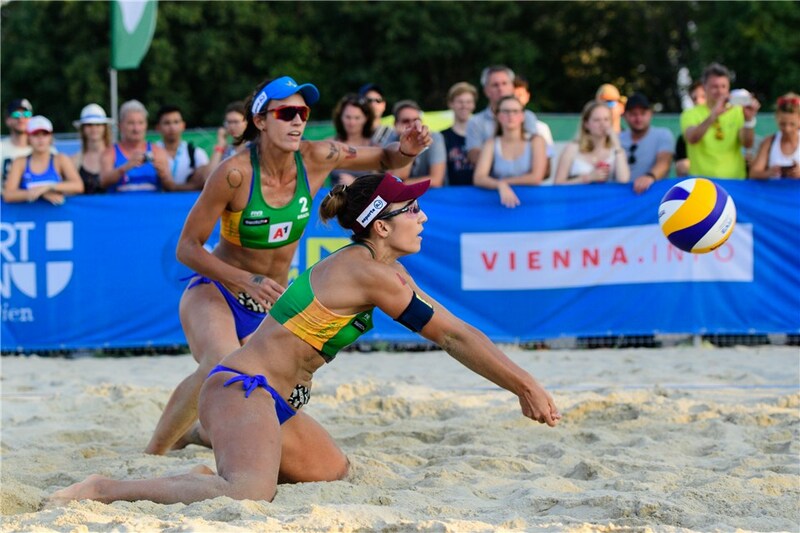 Barbara/Fernanda are aiming for their second FIVB gold of the season, following a win a $40,000 win at the Fort Lauderdale Five Star on March 4. Meppelink/Keizer, who won the CEV European Championship on July 21 and the $20,000 paycheck that came with it, hope to continue that success with another gold medal. The duo also reached the podium at the Mersin Three Star, finishing second. The Vienna gold medalists will take home $40,000, while the runnerup will earn $32,000. The bronze medalist will win $20,000, while the fourth place team will pocket $16,000.